CORRECTION: An earlier version of this article contained an erroneous description of the MyPriceLink program. The program gives GM the capability to change OEM list prices quickly in the estimating systems; it will not input “conquest” prices into the estimating systems as originally reported. The article has been changed accordingly. General Motors will launch MyPriceLink nationally Dec. 1, following what it said were successful pilots of the parts pricing and procurement system by collision repairers and dealers. The program involves “real-time,” dynamic list prices flowing automatically into Mitchell, AudaExplore and CCC. Previously, such changes took as long as 90 days. GM said in July MyPriceLink could launch nationally as early as October, but the Dec. 1 date announced Wednesday still falls within the Oct. 1-Dec. 31 range provided by the automaker. 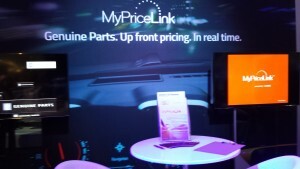 GM’s goal was to have MyPriceLink live ahead of body shops’ busy winter season. One pilot program tested whether GM prices were flowing as intended through the IPs to body shops. The other checked to ensure the dealer could see the orders and have them compatible with dealer management systems. Only collision parts are included in MyPriceLink, and not all of them made the cut. GM has about 92,000 collision parts in its portfolio, and only 7,000-8,000 were identified as “highly competitive parts,” Mayer said during the summer. And in practice, the “real-time” system won’t behave like a stock market, fluctuating wildly by the second. “We don’t change prices that often anyways,” Mayer has said. Body shops’ workflow shouldn’t change at all under MyPriceLink, aside from a momentary pause while their estimating service looks up the GM list price that day. Collision repairers who don’t want this added integration with their estimating services can still get prices via the MyPriceLink portal itself, OEConnection’s CollisionLink or calling a dealership. The program launches about a year after GM announced it at the 2014 SEMA Show, raising concerns among collision repairers and related industries. “At the request of the industry to create minimal workflow disruption, GM put MyPriceLink on pause and spent the past year collaborating with key industry stakeholders, including the major estimating companies, numerous insurers, dealers, dealer management systems (DMS) and body shops,” GM wrote in its Wednesday news release.